A new study shows that when you finish your spouse’s sentences or answer a fill-in-the-blank question, you’re engaging the brain’s relay station for memories, an area that until now was largely neglected by scientists studying language. It seems obvious that speaking and understanding language draw upon our memories – of words, context, people, etc. – but psychologists have typically studied language and memory as separate functions of the brain, essentially ignoring any interconnection. A new experiment conducted by University of California, Berkeley, psychologists shows that memory and language are in fact deeply linked, via the hippocampus, which plays a key role in memory associations. 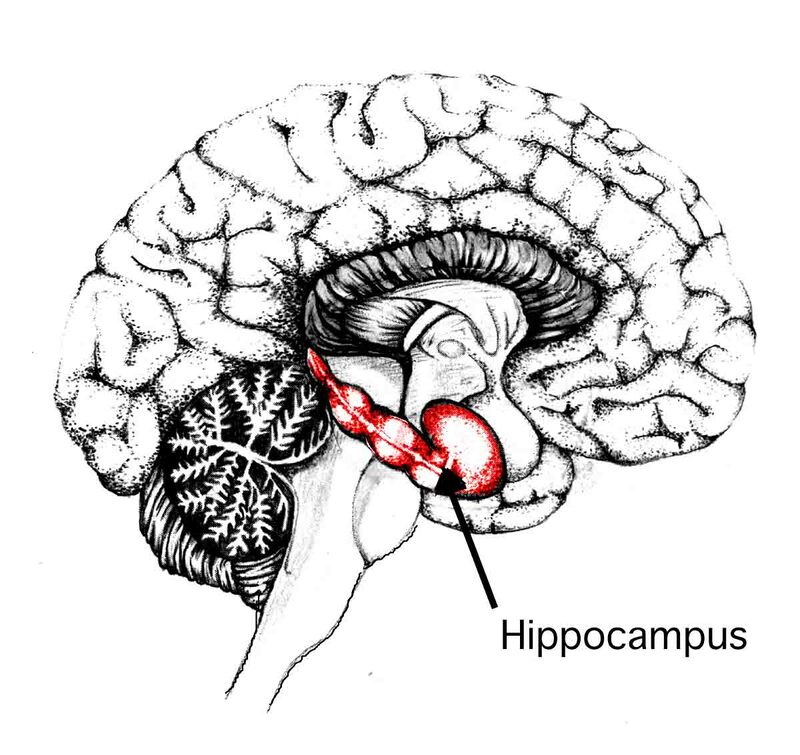 The hippocampus, nestled in the center of the brain, acts like a router to link related memories – the color, shape, feel, scent and taste of an orange, for example – so that we are able to make associations. The brain region’s new role in relating incoming words to stored semantic knowledge is necessary in understanding and generating sentence meaning, the researchers say. Interestingly, researchers recently reported patients with hippocampal damage who had exactly the sort of symptoms one would expect if the hippocampus were involved in language associations: problems relating word meanings to each other and extracting contextual information from sentences and discourse. The researchers recorded neuronal activity using electrodes inserted into the hippocampus of 12 people as they heard fill-in-the-blank sentences with an obvious answer: “He swept the floor with a ________,” for example. In most of the subjects, the hippocampus showed highly synchronized activity as they homed in on the right answer while hearing the sentences but before a picture of the answer was displayed, a sign that the region was making associations throughout the brain to come up with the right word: in this case, broom. According to Piai, deep-brain recording captures millisecond by millisecond neuron firings, showing precisely how the brain deals with language in real time. Language studies most often employ functional magnetic resonance imaging (fMRI), which measures oxgyen flow in the brain, a slow process that doesn’t allow researchers to measure activities that take place in a fraction of a second. The study, co-authored with Robert Knight, a UC Berkeley professor of psychology and former head of the Helen Wills Neuroscience Institute, was published Sept. 19 in the early online edition of the journal Proceedings of the National Academy of Sciences. In the new study, conducted in epilepsy patients undergoing intracranial electrode studies at the UC Irvine Medical Center and Stanford University Medical Center to locate the source of their abnormal brain activity, Piai took advantage of a well-known behavioral effect to explore the involvement of the hippocampus in language. She recorded only from the non-epileptic hemisphere of the brain. 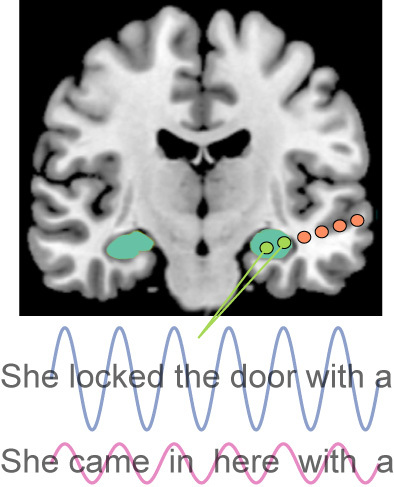 Previous studies of language have shown that people fill in the blank more quickly when a sentence has only one obvious answer – “She locked the door with the ________,” for example – than when the sentence has many possible answers, such as “She came in here with the ________.” In the new study, subjects heard six-syllable sentences, followed by a pause and then a brief flash of a picture of the answer. Subjects were asked to name the picture. In 10 of the 12 subjects, only constrained sentences – those with a single obvious answer – caused a burst of synchronized theta waves in the hippocampus, activity characteristic of the hippocampus when it makes a memory association. Over the years, Knight and others have studied brain activity using electrodes on the brain surface, so-called electrocortiocography, or inserted into the brain, called intracranial recording, and shown that memory neurons vibrate between 1 and 80 cycles per second. Neurons representing associated memories, however, vibrate with a “theta” rhythm in the range of 4-8 cycles per second. One theory is that when one of these associated neurons is triggered, all those vibrating with the same frequency fire simultaneously, giving us recall of related memories. The smell of an orange triggers a picture in the mind, the taste and smell of an orange, and any positive or negative emotions connected with oranges. Piai suspects that when we hear unconstrained sentences, the words do not bring up any related or overlapping associations. The new findings could open up a whole new area of study with intracranial recordings to probe details of the connection between language and memory, Knight said. “This study shows that memory contributes as a sentence is evolving in time; it is a real-time part of our language system, not a slave to the language system,” he said. Other co-authors are Kristopher Anderson and Callum Dewar of UC Berkeley, neurologists Jack Lin of UC Irvine Medical Center and Josef Parvizi of Stanford University Medical Center, and neuropsychologist Nina Dronkers of UC Davis and the Veterans Administration hospital in Martinez. The research is supported by the Netherlands Organization for Scientific Research, National Institutes of Health, U.S. Department of Veterans Affairs Clinical Sciences Research and Development Program, Stanford NeuroVentures Program, National Institute of Neurological Disorders and Stroke, National Science Foundation and the Nielsen Corporation.